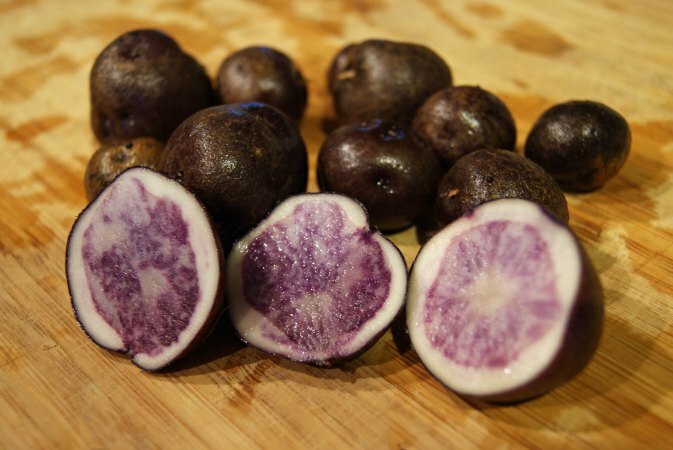 This year we tried some colored potatoes. I love variety, and have looked at different colors in potatoes for several years, but hadn’t done anything until this spring, when I picked up some All-Blue from Seed Savers. Early indications were very promising, as all my potatoes took off and appeared much more robust than last year. Of course, that was back when it was still raining, and once summer hit, they slowed down somewhat. I only watered them a handful of times, which may or may not have had any impact. I think I’m still dealing with nutrition issues, because I haven’t had great yields from any of the varieties I’ve tried, with the largest specimens coming in just a bit bigger than golf ball size. I’m not sure the total harvest I got out of the 2 1/2 lbs I planted. No more than 10 lbs total, probably. Hard to tell, because the dog kept sneaking them while they were curing in the garage, and by the time I noticed… well, it was noticeable. They do look nice when cut (note that it’s more purple than blue), though the only time I’ve cooked them so far has been with beets, which just make everything red. They’re supposed to have good storage life, which is also something I look for. Productivity, they were just okay, but again, I’m attributing some of that, at least, to gardener error, maybe some to dry weather too. I may give them another go next year, but I’m really looking for something that’s a heavy producer and stores well. Maybe I’ll just grow a few of these in a barrel to keep the color aspect. No matter, I have time to think about it. Like, six months.